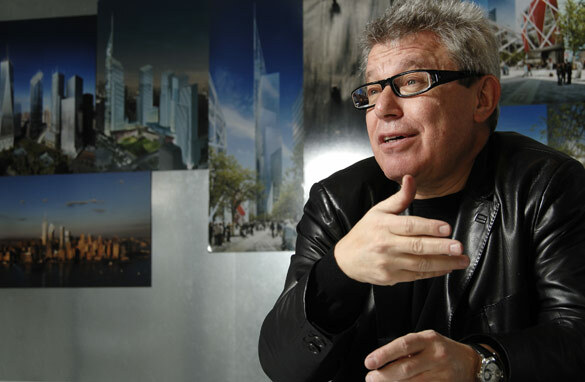 American architect Daniel Libeskind is one of the world's leading and most prolific designers. Incredibly, he has spent most of his life as an academic and only completed his first building 13 years ago, at the age of 52. But Libeskind hasn't stopped since and now travels the world with his wife and business partner Nina working on more than 40 projects in 15 countries that stretch from Italy, Germany and Serbia to Singapore, South Korea and Brazil. While Libeskind is probably best known for being responsible for the master plan of the World Trade Center, his reputation was first cemented with the design of the Jewish Museum Berlin in 2001. He is set to complete another landmark project in Germany later this year – his redesign of the Military History Museum in Dresden. Libeskind, who is of Polish-Jewish descent, is transforming the museum into a 20,000 square meter space that features Germany's military might but also reflects the nature and consequences of war. –	What Mosque Building would you like to see near Ground Zero? –	How will you Improve the relationship between Poland- Israel and Germany? I am awaiting Daniel Libeskind’s replies. What do you think about the 'listing' modern commercial buildings – such as the 1980s Broadgate office development in London – to protect them from being demolished? Hi Daniel, i am a big fan of your work. I am from New Zealand but have completed my Masters in Architecture in Germany. I am currently located in Berlin, searching for full time employment, it's a bit of a struggle. I have just been reading CNN news and saw the opportunity to ask you a question. The question could seem irrelevant, but i think it is the perfect opportunity. Do you have a full time architectural position available for an architectural graduate? How do you feel about the Twin Tower's Alliance? They are, of course, still going to find a place in New York to rebuild the icons that cannot be replaced. "A country's psyche is expressed most visibly in the permanent expressions of art that mankind creates: the buildings and cities that serve as the center of modern life. And there is no other building that symbolized the America of pre 9-11 more than the gleaming twin towers of the World Trade Center. Perhaps the best word to describe these buildings, more than “grand”, more than "powerful", is “completely unapologetic”. America didn’t mind what anyone thought; they didn’t care if the buildings were just a huge block of cement and steel. Indeed, the main reasons from an artistic perspective why these towers are more visually imposing than the taller towers being built today is that they didn’t taper going up- each measured 63 meters by 63 meters for all 417 meters of height. It was a statement against nature itself, since almost all tall objects in nature have a smaller cross section going up. It that psyche that made America great, that made it a paragon that inspired allies and infuriurated enemies. And sadly, nothing illustrates the loss of that power, strength, and confidence than the replacement tower going up. It is, as many put it, a single smaller tower replacing two larger buildings. This representation, perhaps beyond any other, illustrates the change in the way Americans think. They have forgotten what made them the most powerful country on the planet. " There is no secret handshake for the Cranbrook community, if there were I would be pleased to offer you one. Congratulations on your success. Dear Mr. Libeskind: In 2009 the Washington Post named your crystal addition to the Royal Ontario Museum in Toronto the "Ugliest Bulding of the Decade." It was also hugely over budget. How do you address such criticism? So will the new WTC be built in a manner where a controlled demolition is the only way to bring it down? Surely people still don't think those things fell on their own. Thank your War-mongering, oil-whoring republicans for pulling the wool over your eyes. I really liked the Jewish memorial in Berlin and feel that it is the perfect gesture of respect, sympathy, condolence and understanding of what the victims have endured from a country where it happened. I am curious about one aspect of your career, which I came to know about in this article, namely, that you started actually designing buildings only at the age of 52. Was it that you felt you still had to develop and only started designing when you felt that you have reached a stage that you can confidently go ahead, or was it because you were only interested in academia early on and then your interests diversified., or something else. Forgive me for being so direct, but it is because I really like your designs. Being an architect from India, living in Germany and working in quite a different field (multimedia), I would also like to know your opinion about if it is possible to have an universal language ( in today's world) of design where at least some, if not all aspects of a design are understood in the same context by everyone. Is it important for you that your design is viewed and understood in the same context as conceived by you or are you happy with different interpretations. In addition, it is important to point out that the only reason that gleaming, state-of-the-art Twin Towers are not standing today is because elected officials felt free to deceive the public. The reason the World Trade Center looks the way it does today is because officials have foisted a plan on the public through deceit that the people would never accept if informed. Swindle is too mild a word. The by-products of such a corrupt policy are necessarily illegitimate. If the public were shown how in four years, by the end of 2015, we could have a far better World Trade Center than is now planned, one that is far more popular, inspiring, and profitable, they would support whatever is required to make the transition. The media has been instrumental in the suppressing the facts and should take the lead in exposing the truth. "Twins for A Reason" on the Restoration Alternative page of the Twin Towers Alliance site (www.twintowersalliance.com) would reassure Mike Snow about what the Twin Towers stood for. The “psyche that made America great" is the belief that the people are in charge of our government and therefore of our destiny. If the Governors of NY and NJ do not correct course (which we believe they soon may,) then the WTC will be a monument to government Of the Scoundrels, By the Scoundrels, For the Scoundrels. Checking back before bed, I was surprised to find you never posted the comment I submitted this morning. So I guess you proved my point. You could post a comment about controlled domolitions but not one that addressed itself to the other comments? Thank you for the belated posting. I don't understand the random timestamps. The 6:20 pm stamp was assigned to yesterday's post when I submitted it in the late morning/early afternoon. But it was still being moderated after 1:00 am this morning, when I sent the follow-up. Then 6:15 am was assigned to that one - apparently irrespective of when it was posted. What's the point? As for the original comment, I understand that Mr. Libeskind swims with the sharks so I won't ask him any questions that he would find difficult to answer truthfully. But his plan at least showed heart and soul - the current pitiful project is devoid of either. Hard to imagine that we graduated from Cooper Union over 40 years ago!!! Keep up the fabulous work.